Ooh-wee, baby, ooh-wee. The good times rolled and the great beer flowed at Pacific Gravity’s 13th annual Summer Party on July 18, which brought a bit of New Orleans revelry to the Pacific Palisades plantation estate of club member Dean Sussman (right), the site of the celebration for seven years running. Bedecked in strands of Mardi Gras beads, over 275 club members, guests, families and friends got their Creole on for this homebrew fais do-do, grooving to iPod mixes of N’awlins funk, Cajun zydeco, swamp rock and Dixieland jazz, noshing on Louisiana-styled eats, and swilling down a wide variety beer –– both homemade and commercial –– and sodas. And the perennial “Home Brew Club Summer Party Band” reformed once again to contribute a couple sets of booty-shakin’ blues rock. Think Fat Tuesday during Mardi Gras –– except nobody had to give anything up the next day! Special guests at the party, all of whom were among the many who donated gifts for the party raffle, included Larry James of Wine Warehouse distributors (who brought along a four-year-old keg of Echte Kriek! ), former club member Michael Bowe of Angel City (who tapped kegs of his Vitzen and IPL – India Pale Lager), Paige Reilly of Shmaltz Brewing, Brian Lenzo of Blue Palms Brew House, Ryan Sweeney and Brandon Bradford of Verdugo Bar and BoHo, and Billie Anderson of Lucky Devils. Also, beer-blogger Sean Inman was in the house, and covered the party for the Food GPS blog. Club master chef Ian Fraser came out of semi-retirement to oversee and help prepare the massive New Orleans-influenced feast, served buffet style as always, with club activities director Michael Steinberg, Barry Novack, Jen Muehlbauer and others ably assisting. The biggest feed to date for a PG event, the menu consisted of four versions of gumbo (courtesy of Peggy Robinson, Reed Wilson, Rick Hayes and club vice president Dan Hakes), three different jambalayas (Carmen Hill-Lindsay, Eric Moreau and Jeff Koehler), five varieties of Mac ‘n’ Cheese (Matthew Rick, Mimi Bardet, Robinson and Hayes), three kinds of cornbread (Diane McClain, Leroy Lauer and Bardet), and four dishes of red beans and rice (Connie Leonard, Greg Beron, Fraser and Steinberg), as well as shrimp and veggie boils (Beron), Cajun sausage (club webmaster Lee Bakofsky), deep-fried turkeys (Marvin Campbell), and much, much more. And of course, the obligatory ice cream bar was reprised, among other tasty desserts. Over three-dozen homebrews were on tap, as well as a half-dozen homemade non-alcohol sodas and several commercial beers to wet the whistles of the thirsty Mardi-party-goers. And for authenticity’s sake, Ian concocted a cooler full of rum-based Hurricanes. As to be expected from this crowd, there were some interesting takes on classic beer styles, as well as some inventive use of ingredients. Among them: Mike and Kate Lambert’s Blackberry Wheat, Luis DiStefano’s Tamarind Mead, Jonathan Porter’s Liquid Smoke Schwarzbier, outgoing club treasurer Jessie Golman’s Chamomile Wormwood Tripel, Culver City Homebrew Supply’s Wheat Porter and Bob Kaisaki’s dessert-ready Vanilla Porter. And speaking of Porter (the brewer not the beer), he (Jonathan) won the grand prize for the Best Beer of the Party with his Wrecking Ball Aged Bourbon Imperial Stout. Townsend presented him with a $100 gift Certificate from the Blue Palms and will have his brew on tap at that Hollywood bar. A Baker’s Dozen of the homebrews were “Monster Brews,” all originating from wort prepared at Tustin Brewing Company at a club monster brew session held in May. Varied versions prepared from that shared beginning included such suds as Brendan Shannahan’s Huckleberry Highlander, club competition coordinator Carl Townsend’s American Pale Amber Ale, Koehler’s Trappist-style Ale, Bakofsky’s Dubbel Espresso, and the winning beer in the Monster Brew contest: Belgian Golden Strong, which earned its brewer, Hakes, a $50 gift certificate to Library Alehouse in Santa Monica. On the soda side, such Southern tastes as Neil Saund’s sweet-and-sour Lemonade, Beron’s New Orleans Nectar Soda, Hakes’ Mint Lime Soda served the non-alcohol and underage set. The best-voted non-alcohol drink was Tom Rierson’s Orange Julius, which was much better than the commercial version and earned him a $50 gift certificate to the great Seal Beach restaurant/beer bar, Beachwood BBQ. Following the announcement of the beer and soda winners was the traditional raffle of beers, brewery swag, gift certificates and brewing equipment, conducted with typical aplomb by club president Craig Corley. Lucky ticket-holders included Miles Stumbaugh, who won a complete brewing system; original club member Jim Belsha, who won a complete kegging system; Rob Kadota, who won an immersion chiller; Rex Jensen, who won a Franziskaner beer umbrella; and Bob Henderson, who won a $100 gift certificate to CCHBS. Congrats to all! But hopefully, she’ll come back to party with us next year. And we hope you do too. We don’t know what the theme for 2010’s bacchanal will be yet, but rest assured, there will be plenty of good food — and great beer. It wouldn’t be a Pacific Gravity party if it was anything less! 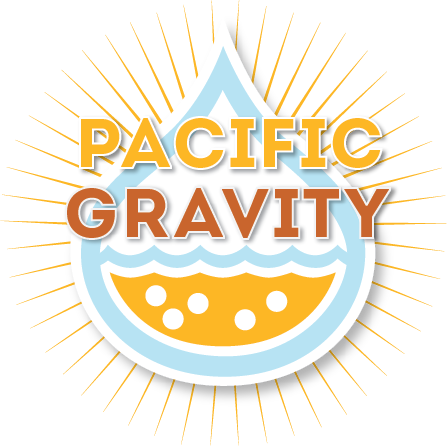 http://pacificgravity.com/wp-content/uploads/2015/01/pg_logo.png 0 0 Brian Holter http://pacificgravity.com/wp-content/uploads/2015/01/pg_logo.png Brian Holter2009-07-31 16:12:192009-07-31 16:12:19Pacific Gravity’s Summer ‘Party Gras’: Who Needs a Bayou When You Got Beer?